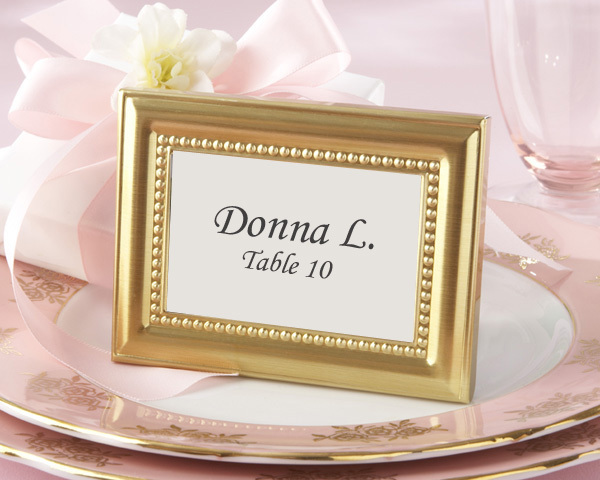 Beautifully Beaded Gold Photo Frame/Place Holder - EconoBride - Budget friendly wedding favors. Waiting behind crystal-clear glass surrounded by beads of bright gold is the perfect place for a favorite photo of the happiest couple you know�a thoughtful gift of appreciation your wedding guests will always treasure. Or use our Beautifully Beaded Photo Frame as place holders, letting your guests save their favor for a favorite photo of their own. The finely crafted, versatile, glass-and-metal frame, with its gleaming brushed-gold patina, has a velvety-black finish on the back and accommodates either horizontal or vertical photos 2 �� x 1 �� in size. This elegantly detailed photo frame measures approximately 3� x 4�.